Wishing anybody who reads our blog, a very Merry Christmas and a Happy New Year! Ashnah had a fabulous night of dancing at the Christmas Ceilidh at Grove, and were delighted to be joined by some of our friends and the brilliant Oxford Drum Troupe (ODT) who played for us. Thank you guys, it was wonderful working with you and thought the combination of groups went down a treat!! After our performance we joined in with the ceilidh dancing which left us all in hysterics as we got it completely wrong!!! Think I for one will stick to what I know best ..... ATS. 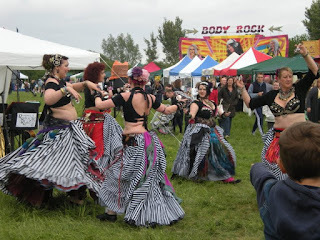 Check out our Video page for our 3 tracks and as a bonus .... our attempt at ceilidh dancing!! Enjoy!! This years fundraiser took place at the lovely Guildhall in Abingdon, and let me start by commenting that we should all be so lucky to have such ample changing room facilities - with mirrors no less!! The guest groups at this show included Rosehips who showed up with live musicians in toe, Helen Sleiman's group who were beautifully framed by colourful and vibrant silk veils, and firm favourites Hathor .... to name but a few. A special mention has to go to the Cairo Kittens who set pulses racing so much it affected and short circuited the sound system twice!! The Cairo Kitten ladies, minus their prima cat, Jo Saunders, scorched the floor in hats and hot pants and made their teacher proud. 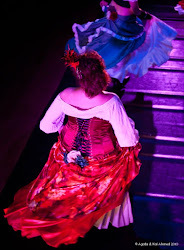 Another shout out must go to Kay O'Regan of Rosehips who performed her first ever solo, dancing to the very dramatic Roxanne - congrats - it was beautiful. As for Ashnah, we performed twice and were very happy to be joined by our beloved Esme on the second number ... may it be the first of many. See our 2 performances on our Video page. 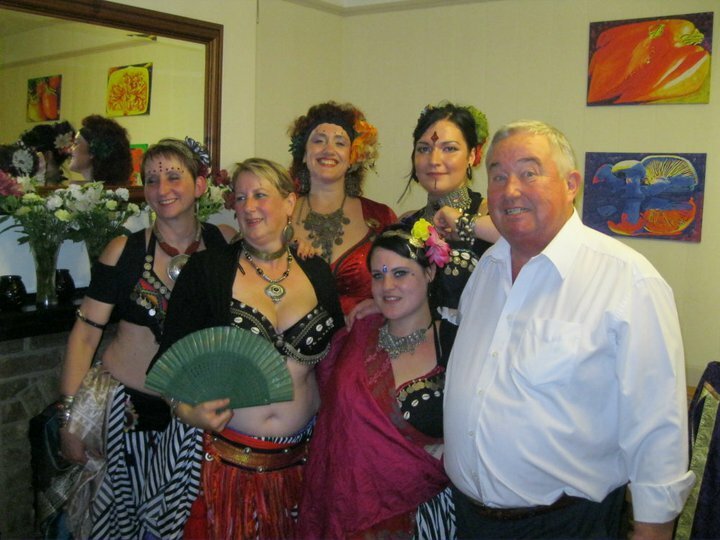 Having had the pleasure of working with the Sahara Sisters’, we were invited to perform at their annual hafla, an offer which we were delighted to accept. On arrival there, it took us a minute to take in the location and less than that to sigh in relief - the hall was a beautiful large room full of little period architectural gems, there was a yummy food corner and rather nice bar, a solid looking sound along an elaborate lighting system. The Chippenham ladies had set everyone up and this group for one was really appreciative! As it turned out, I personally think this event was the largest indoor event I danced at. 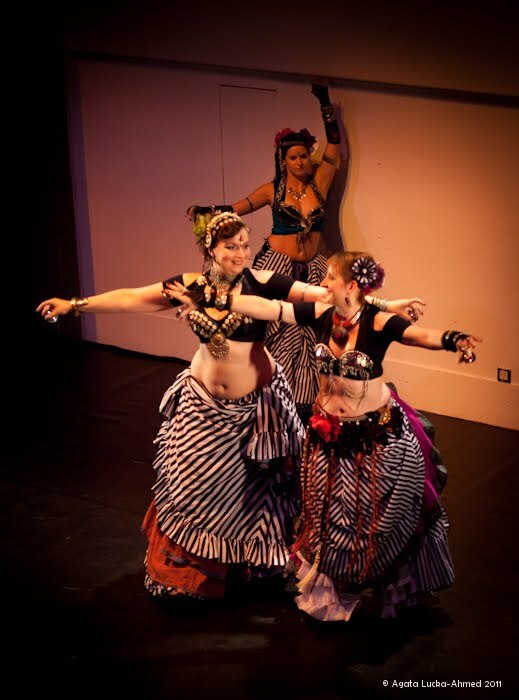 The evening’s programme was eclectic and the Sahara Sisters’ showcase was bright, and colourful, and vibrant and went down a treat. Visiting performers included amongst others the lovely Helen Sleiman, the mesmerising Malmsbury girls and the ravishing Raheesha with her Desert Divas. We had a wonderful evening, had some outstanding professional photos taken (see our website), scorched the floor, and drove home wonderfully spent!! September - Firstly, what I remember of my first venture into this town is how absolutely enchanting it struck me.. full of rather large churches.. until I found out that it’s England’s oldest borough and with 1000-year-old history, it really is hardly surprising!! 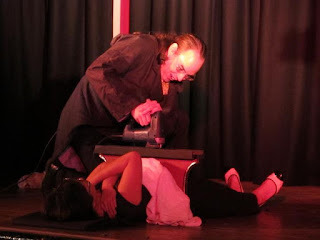 Our evening was quite novel as it was hosted by a raconteur come comedian come magician, Ashton Carter who made for smooth transitions and distinctive announcements, and his amazing magical 'saw the lady in half' act with willing (or was that unwilling) volunteer from the audience! 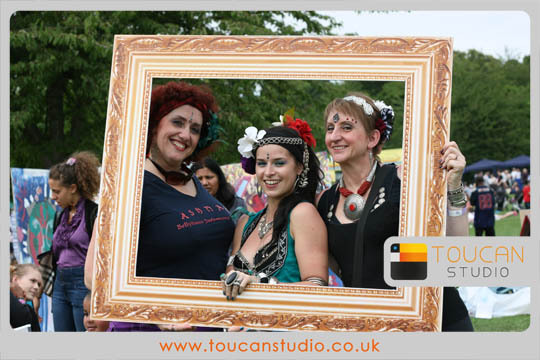 The event looked completely sold out and we met up amongst others with fellow dancing groups such as Sundara, Brutal Belly Dance, Sahara Sisters, the Swindon Shimmyers and Zanoba. 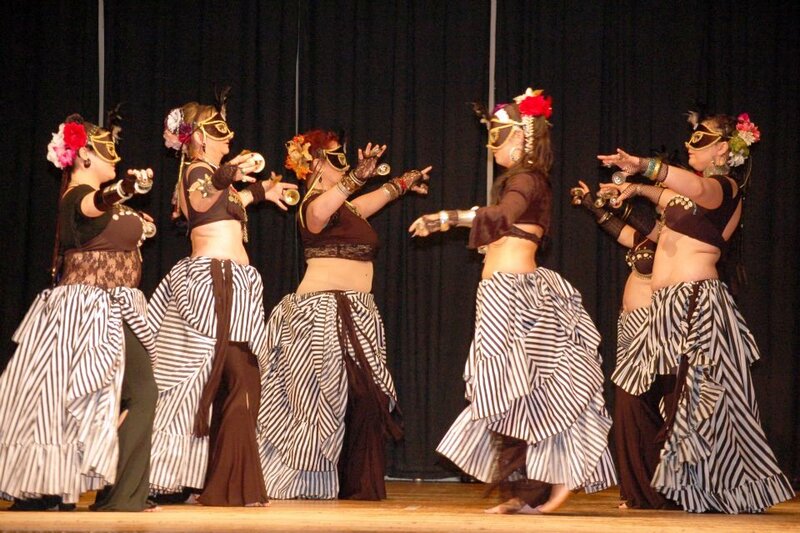 Ashnah premiered their masks which were bought specifically for this event and which went across a treat. 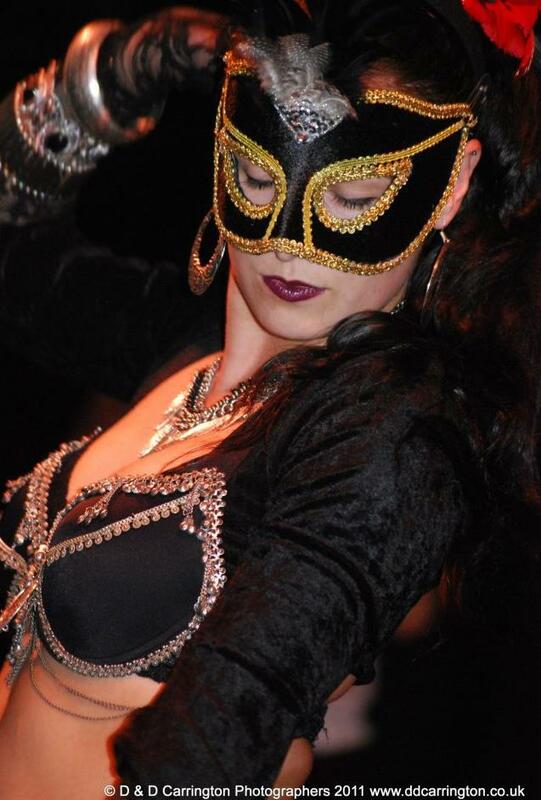 I must give a mention to the absolutely gorgeous Xenia who enthralled us all with a creative choreography involving a veil and rocked it out to a dramatic piece of music.. Back to the light! 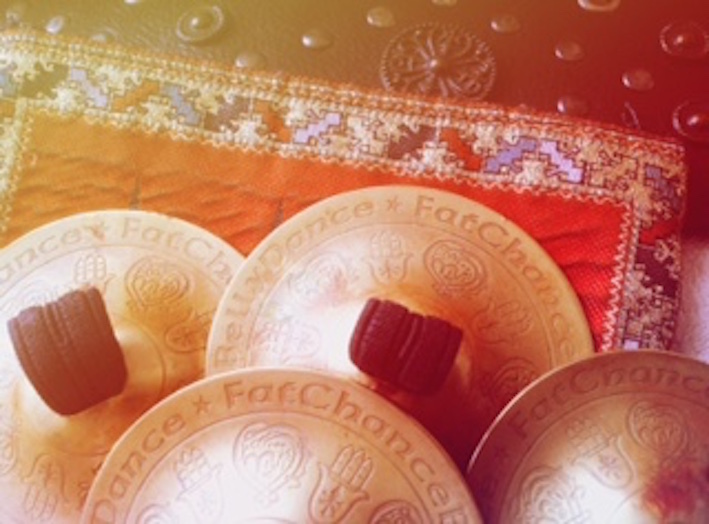 Catching up on our blog articles, I now come to Hathor, June 2011. 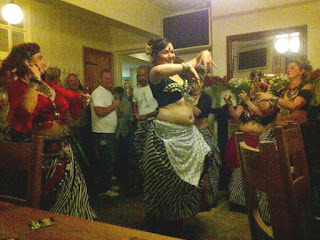 Ashnah attended Hathor’s annual shindig at Exeter Hall in Kidlington back in June and as usual, the hafla didn’t disappoint and neither did the laid on and much appreciated sustenance!! 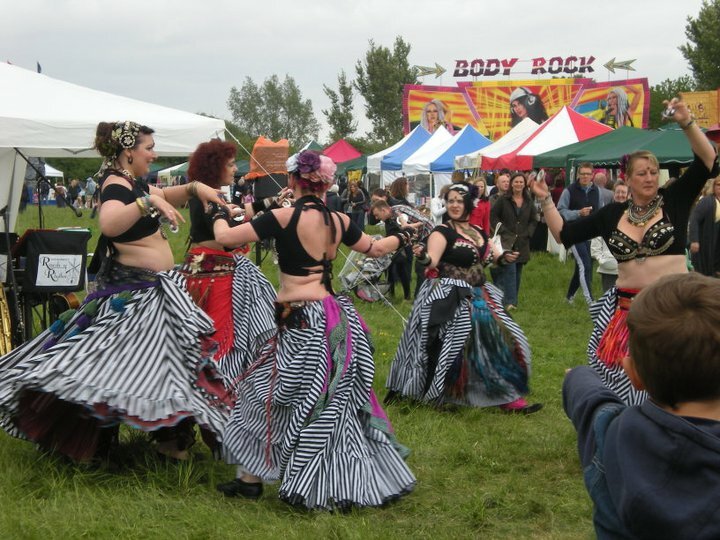 This event is one of the larger local ones to Oxford and a very popular rendezvous - this year, the gathering was in aid of Oxford’s Food Bank. 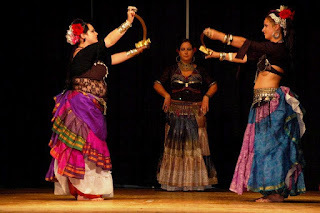 Groups and soloists covered a whole range of styles and the programme included traditional Egyptian, folkloric, modern fusion, and ATS bellydancing. The wonderfully organised evening was rounded off by our Hathor hosts bumping and shimmying to Flo-Rida’s infectious and most aptly titled Club Can’t Handle me rhythm – roll on 2012!! D day (- 1 hour). We set off to Wantage making our way to the Shoulder of Mutton pub; this was going to be our first pub gig and we were all very excited! The agreed upon strategy (and yes we were approaching it like an operation) was to ring our host, Peter Fowler, on arrival in order to access the venue through a side entrance thereby maximising our impact - and what an impact it was! We were even asked to perform a fourth slot but decided to “leave them begging for more”. We’d made provision to get everybody up and dancing and that proved a very popular idea. D day (+1 hour) We had a truly memorable evening at what we discovered to be an enchanting pub we would recommend to everyone. Venimus, vedimus, vicimus!!! Ashnah dancers with partners, buggy and baby plus 1 dog in toe made their way to this fabulous event. 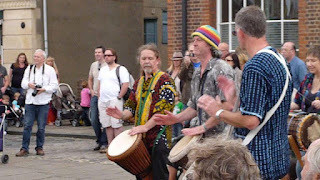 We were all naturally very excited as we were looking forward to a live music collaboration with the wonderful Oxford Drum Troupe (ODT), an Oxford based group who specialise in African music. I personally can’t say enough about the day we had, the collaboration with the drummers, and of course the festival which brings together all the differing and colourful strains of Morris dancers who so effortlessly and colourfully mingle with us Middle Eastern dancers – even Jo and Josephine Public play dress-up with the opportunity for face-painting available to young and old alike.. I will naturally always maintain that such festivals stand and fall with the sustenance provided. The catering at Bunkfest this year was again faultless with Chinese, Spanish, Indian, French and Vegetarian a la carte.. not forgetting the beer tent of course.. and the delicious ice cream and oh.. crepes.. and I almost forget the lovely gentleman who kept my thirst at bay with the most delicious and freshly squeezed lemonade.. If you’re reading this and you happen to be around the area at the beginning of September then why not take the family for a glorious day out - I can’t recommend this event highly enough!! Make the decision to throw a big community event and put the call out to musicians, group dancers, singers and any and all relevant artistes, add the absolutely necessary presence of food and drink, garnish with all manner of stalls such as jewellery and local crafts, not forgetting good causes, sprinkle it with 20,000 people - and VOILA - you have yourself the potential for what turned out to be a most eclectic, colourful, and wonderfully musical Cowley Carnival!!! The sun joined the party and ensured a great turn out and a fabulous bash on Sunday afternoon in Oxford. Ashnah had been looking forward to taking part again this year, and although only 3 of us could make it, I can happily report that we gave out plenty of good energy, caused a most positive stir, acquitted ourselves very well, and had plenty of time to relax and enjoy ourselves. Roll on next years carnival woo hoo!! We were once again invited to perform at the Indian Mela at Sandhills, Oxford, by the wonderful Kanta Gopal on behalf on the OHTCCP (Oxford Hindu Temple & Community Centre Project). What a glorious event this is - full of colour, music and dancing - styles this year were Hawiian, Bhangra, Classical Indian dance and ourselves performing American Tribal Style Bellydance. There was delicious Indian food (oh it was so good), henna (mehndi), singing by the Afropean Choir, drumming workshop by our dear friend Paul Eagles (great fun), whilst families danced, ate, joined in the workshops, chatted and thoroughly had a great time. The weather held out, though a little windy perhaps, and the sun came out in the afternoon. 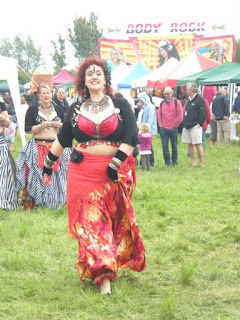 Ashnah had a fabulous time again this year and we take great delight in meeting such warm, friendly people and joining in with the celebrations. What a wonderful day we had!! For the 2nd year running, Ashnah danced at the Abingdon Dragon Boat event, and in all the 3 years we've been together this was the first time we were confronted with chilly damp weather - what a shock to the system brrrrr!! 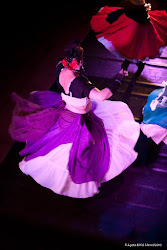 For 30 minutes we danced a variety of our numbers - a lively one with zills, next a slow and senuous one, a solo from Rita, a stick dance and the finale ended an improvised piece. It's very difficult to dance along by the riverbank as the curse of the long grass dragged at our long skirts causing us to trip as well as the unsure footing in ruts and over bumps making spinning hazardous. Nonetheless, beer, burgers and ice-cream went down well and we all thoroughly had a brilliant time at this fabulous event. ......... wonder if I can fit my lawn mower in the car for next year ..... ? 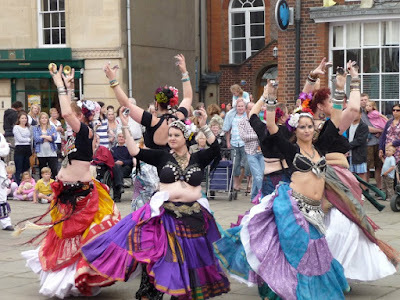 The wonderful OMEDS hafla delighted us yet again - such wonderful dancing by many fabulous dancers - what a vast variety to keep many a spectator entertained!! Ashnah dancers Jen, Hannah, Agne and myself (minus Rita and Pips who were attending a wedding) donned our new uniform of striped skirts and headed on into Oxford to perform an ATS improvised number. It's very difficult hiding a tribal costume until appearing on stage - 4 or 5 layers of clothing consisting of pantaloons, two 17 yard full skirts, tribal belt and/or shawl too with flowers and tassles complete with tucking the 2 skirts up into the waistband - all topped off with a tribal coat over the top, we often resemble something out of a Dickens novel with hooped skirts!!! The talented photographer Agata Lucka-Ahmed was again on hand snapping away at all the dancers, creating stunning photo's. Check out her website!! The rain washed down that evening, but it didn't dampen anyone's spirits at the fabulous hafla. Ashnah were invited to take part in a most worthy cause - a show in aid of Against Breast Cancer and Oxford Radcliffe Hospitals Charitable Funds. The wonderful Variety Show took part in St Helen & St Katherine school theatre on a most humid, sultry evening, which proved extremely difficult for those wearing layers of costume!!! 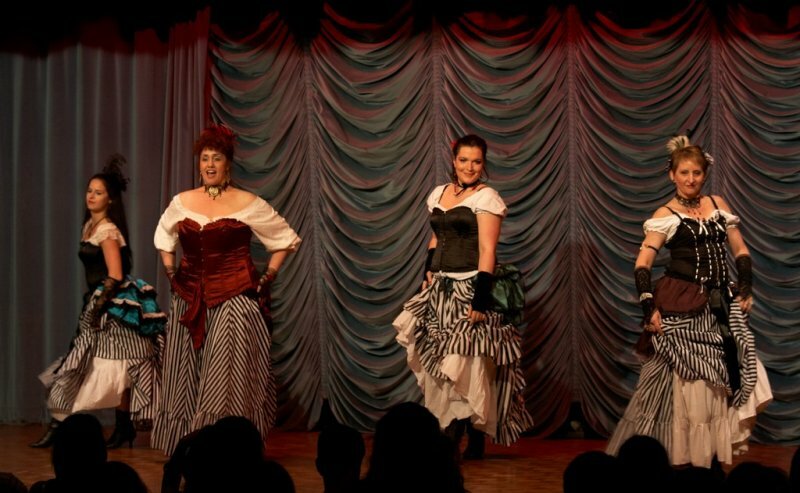 The show consisted of wonderful acts - a singer, comedy, magician, pianist, flute player whilst we opened the show and also our 2nd number closed the show at the end. Ashnah's most major and anticipated bellydance event came upon us on the 28th April, and after setting off to London by coach we checked into our hotel, re-boosted our flagging energies with the most delicious pizzas at a local Italian, then proceeded to pamper and preen ourselves in preparation for the night. With much amusement to the taxi driver having 4 costumed ladies in his cab we duly arrived at our venue, Darbuka. 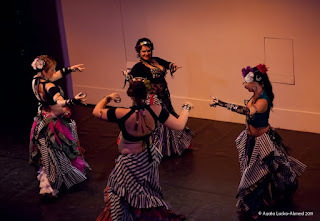 By the time Ashnah's performance was up, our costumes had generated so much interest that they got a mention in our announcement!! Our 'sassy chicks' dance performance went across beautifully and left us all buzzing!! A few numbers later (and after what was for me a quick change), my solo was up. As usual, good vibrant music had the audience on side cheering and clapping. It all went well and was certainly an experience not to be missed, culminating in our hostess paying us the best compliment by inviting us back. The day after our performance, still in London, we took in the wonderful atmosphere of the Royal Wedding celebrations with many other like minded people, cheering at a huge TV screen we happened upon in a bar in Victoria. People were sitting on the floor, bar stools, standing in doorways, craning to see 'that kiss' on the balcony, and rushing outside to the fly past on the planes. Truly a wonderful 2 days!! Abingdon Town Council hosted the local International Day of Dance and showcased a rather varied and eclectic programme. 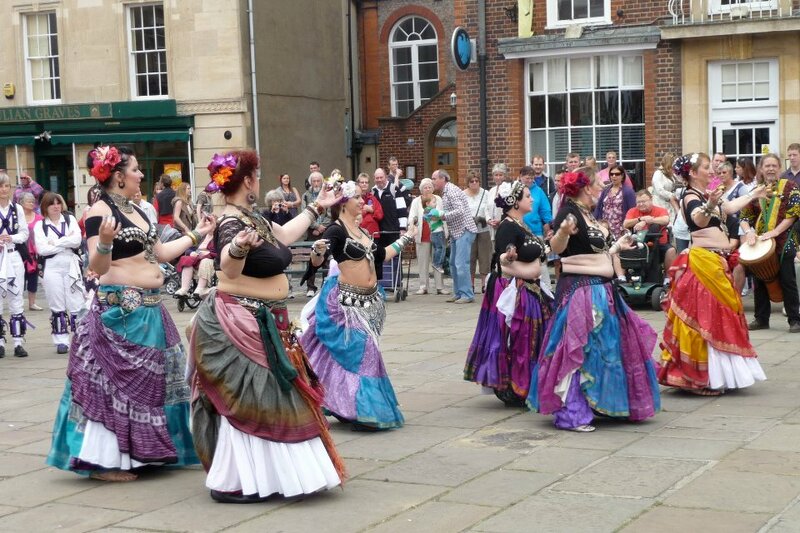 On show this year were Indian, Thai, Swing, Scottish, Irish and Balkan dancing, and of course Abingdon's own Ashnah performers. The event was compered by the inimitable Town Crier John, and none of it would have been possible without the sun coming out to play and bringing along a nice big crowd. March - I travelled to Rochford, Essex for a 4 day intensive dance training course with the wonderful Carolena Nericcio (pictured presenting me with my certificate yay! 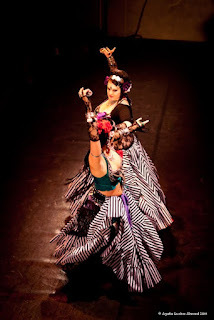 ), founder and Director of FatChanceBellyDance, and hosted by Morai and Tribal Unity for my General Skills. After watching the spectacular show Tribally Inspired featuring 7 of the UK FatChanceBellyDance Sister Studios and seeing Carolena perform (magical), the next 4 days were incredibly hard, not only on the body but also the mind, remembering all the FCBD moves, floor work, formations, cues, hand placements (how many floreos went with what??) ....... In between dancing, I met old friends, made new friends, dined, socialised, and gained my General Skills certificate at the end. Brilliant time!! Sue Bickell and her ladies hosted their second hafla in Swindon in aid of Prospect Hospice which raised a whopping £476.50 woo hoo!!! Well done ladies. 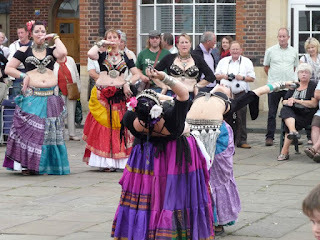 The programme was pretty eclectic and the likes of Tracy Jones and Helen Sleiman who came with their students, flew the flag for traditional Egyptian and before you ask, yes they strutted their own stuff beautifully! I couldn’t possibly name everyone who performed, but the lovely Luisa Taylor also took to the floor and unashamedly worked it, the Malmsbury girls showed us how fusion should be performed whilst us Ashnah gals danced our Sassy Chicks number once again followed by an American Tribal Style number in which we incorporated pairs, trios, chorus and anything else that seemed to just form in this unchoreographed number J The evening ended with everyone taking to the dance floor to the tunes of Abba and Saturday Night Fever, so overall a tremendous success!!! I’m back from Majma 2011. The Lady Raheesha beckoned and I went as along our gracious hostess, Hossam & Serena Ramzy were heading the cast of top notch teachers. 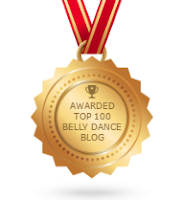 I also signed up to Katie Holland’s Samba-belly (and what a workshop to kick off the day after the night before!). 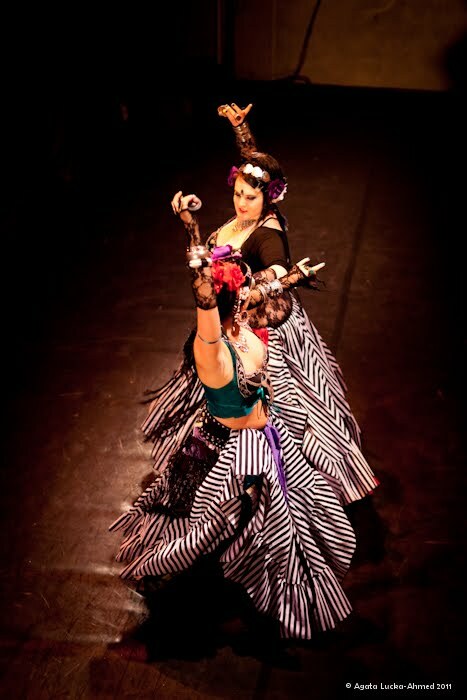 I followed that class with a Rumba Flamenca one headed by the grande dame herself, the lovely Valerie Romanin and what an absolute joy that turned out to be! Having rubbed shoulders with the great and the good and witnessing such first rate performances where the dancer became an instrument reflecting the music, came the time for the amateurs to showcase and tread the light fantastic. I suppose you reap what you sow and I have a way to go!! I had such a wonderful and fulfilling weekend and oh yes – I bought a dress, Courtesy of the lovely Meena – yippee! Langdale Hall was once again the venue for Nikki’s Winter Wonderland and this year’s programme provided a nice variety.. Our hostess, the glamorous Nikki was as usual light of foot and cheeky and wonderfully supported by John Sleiman – she even had the opportunity to showcase her earlier Samba workshop with some of her pupils; ever effacing, she hit the floor in gold lame hot pants and bra, crowning her outfit with green and yellow feathers! Other exponents of traditional Egyptian were Dodo Pratt, Helen Sleiman and after a spell, yours truly! The cheeky Louisa strutted her melaya dance with a decided, dare I say, almost natural abundance of “get up and go” and well.. bagged and left with Gary!!!! Group-wise, Isisters and Hazzaz’s invasion was as colourful and as enthusiastic as ever infusing the hall at large with much enthusiasm and joyful mayhem. The Ashnah girls took the opportunity of wearing our much loved corsets and feathers along other Victoriana paraphernalia to perform our sassy chicks’ dance. Of note of course was our gorgeous Hannah (with brand new hair style) making her debut – yippee! 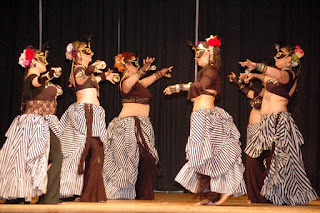 Loreley Rice’s Ngoum el Leyl rounded off a most enjoyable evening with the multi-prop production of Pharaonic Odyssey.